We’re down to the Final Four at the European Championships, as the semi-final round begins this afternoon in Ukraine with Portugal facing Spain and will continue with tomorrow’s match in Poland with Germany and Italy squaring off for a spot in the finals. According to most people who follow the sport the four best teams remain, which should have these next couple days featuring some excellent football in anticipation of Sunday’s championship match. There is a whole lot of star power remaining in this tournament as every team has players who are recognizable to even the casual fan, and there aren’t too many things better than seeing the best players in the world’s most popular sport duke it out. The fact that they are doing it for their country makes it even more appealing, so you can be assured that there is going to be plenty of fire and passion in each 90 minute semi-final as each team battles it out for one final match at the Olympic Stadium in Kiev. These two teams play a very similar possession and passing oriented style. They are both teams who are also very content with a 1-0 score-line. Whoever scores the first goal in this match should have the upper-hand, but they also know enough not to rest on their laurels as each team has the firepower to score in bunches if the other’s guard is down. Portugal advanced to this match by way of beating the Czech Republic 1-0, thanks to a 79th minute goal from Cristiano Ronaldo. After a slow start to this tournament, Ronaldo is now tied for the tournament lead in goals with 3, and is truly playing some brilliant football at the moment. 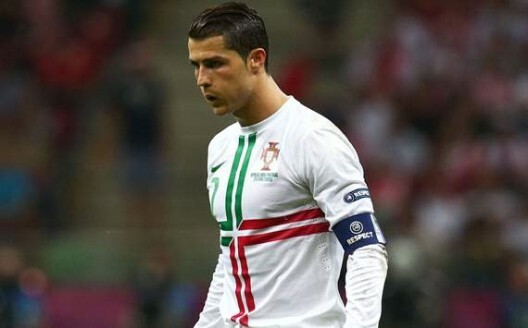 SportsPro, a monthly British magazine that reports on the business and financial aspects of sport, have selected Ronaldo as the 5th most remarkable athlete in the world (based on his marketing potential over the next three years), and a tournament like this can only help Ronnie. Another goal would be even bigger. Spain advanced to this tournament’s semi-final by way of beating France 2-0 on Saturday. To be honest, this wasn’t one of the most exciting matches that I’ve seen, but then again I’m not a fan of the Spanish team and couldn’t care less if the French were even in this tournament. This was a match that Spain controlled from start to finish and two goals from Xabi Alonso (19th and 90th minutes) were the difference on the score-line. In my opinion this match wasn’t even that close. Portugal brings along more talent than the French did, but from my perspective I see Spain winning this match this afternoon, and unless Ronaldo scores then it could be a rather simple win for the Spanish. Tomorrow’s semi-final is the one that I’m looking forward to more than today’s match. There could be some fireworks in this match, and I expect it to take at least two (maybe three) goals to win this match. In European Championships, the Germans have won 5 of their last 6 semi-final matches, but they also have never been able to beat Italy in a major tournament. For people who have a good memory (or are fans of either of these teams) you might remember that these teams did matchup in the 2006 World Cup semi-finals in Germany, and the Italians managed to pull off the upset with two extremely late extra-time goals (119th and 120th minute) on their way to winning that World Cup. Tomorrow Germany plans to enact some revenge, but it sure won’t be easy. Germany advanced to this match thanks to beating Greece 4-2. This was an easy match for the Germans, with Lahm scoring before halftime, and then Khedira, Klose, and Reus answering a 55th minute goal from Samaras of Greece before Salpingidis added a meaningless penalty kick in the 89th minute. Germany controlled this match at midfield, with Sami Khedira, Bastian Schweinsteiger, Marco Reus, and man-of-the-match Mesut Ozil dominating possession and running the flow of the match. Germany will need another big effort from this group of guys tomorrow if they want to beat the Italians, who have a strong midfield themselves. Italy, who has only won one match in regulation so far this tournament (defeating Ireland in the group stages) got past England on penalty kicks on Sunday after a scoreless draw through regulation and extra-time. The Italians did have one goal waved off for off-sides in that match, and were lucky that Wayne Rooney did not convert on a diving header that he sent over the crossbar, but I’ll give the Azzurri credit as the better team on Sunday. The Italians have a great team, and an even better goalkeeper in Gianluigi Buffon, but they will need attacker Mario Balotelli to get involved in the action. 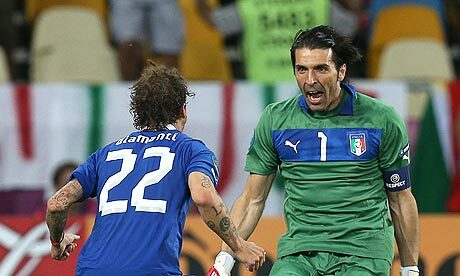 Midfielder Andrea Pirlo has been the best midfielder of Euro 2012 and the Juventus playmaker could be the difference in this match if Italy were to win. My personal guess is that Germany will advance, and I’ll go with a 3-2 score, but this purely a guess on a match that could go either way that I expect to be entertaining throughout. 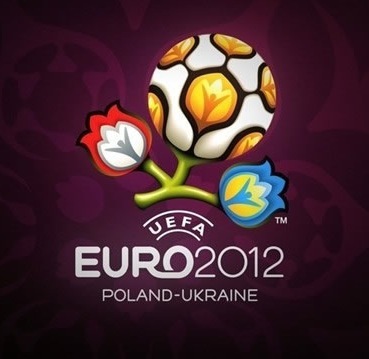 This entry was posted in Soccer and tagged Euro 2012, European Championships, Football, Germany, Italy, Portugal, Soccer, Spain, Sports. Bookmark the permalink.